Mobility, security, and performance for business customers. 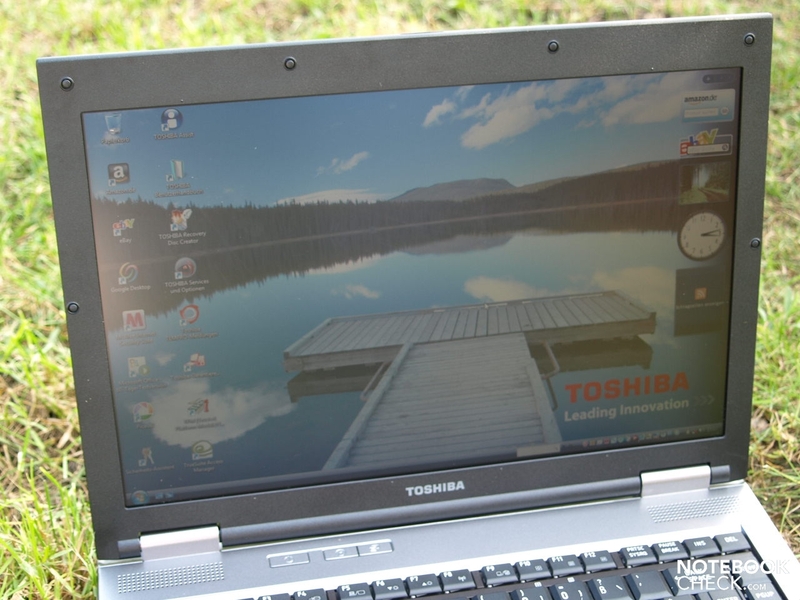 With the Tecra family Toshiba bundles its business-line devices together, which should appeal to mobile business customers due to their security and performance features. 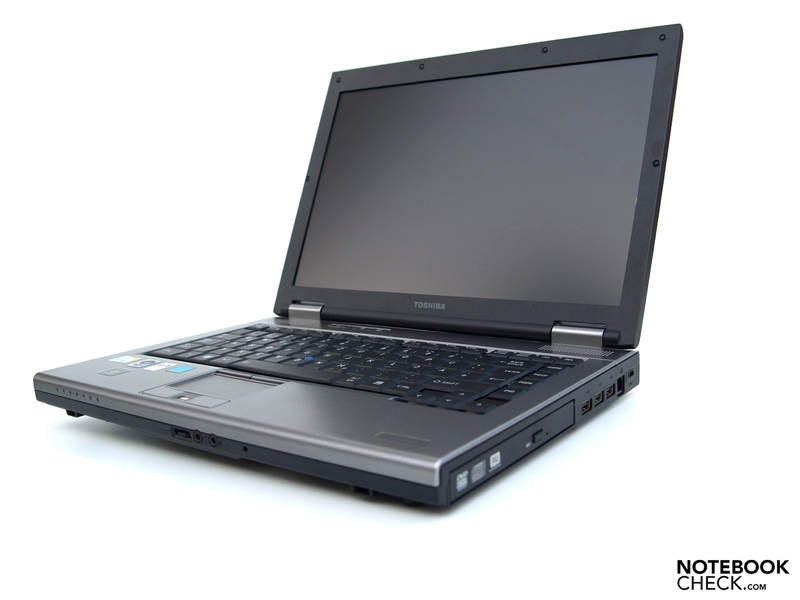 For our test we had the model M10-1D7 available, which currently represents the flagship of the series, with an Intel Core 2 Duo T9600 processor and Nvidia Quadro NVS 150M graphics card. Note: There are currently several models of the Tecra M10 series available in Europe, which vary substantially according to the performance related components they contain. 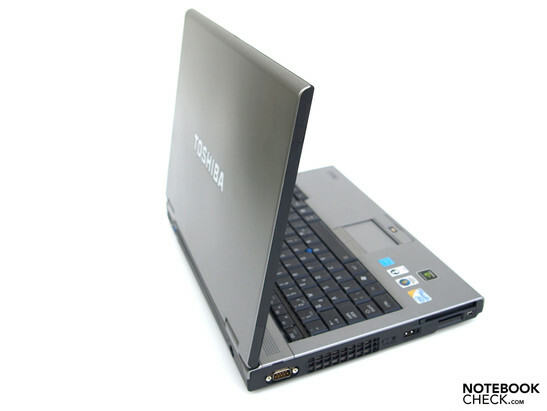 While all models are fitted with an Intel Core 2 Duo CPU, the lower budget models only contain an integrated GMA 4500M HD graphics chip. Especially in the USA, it is possible to personally configure the Tecra M10 to a certain extent. 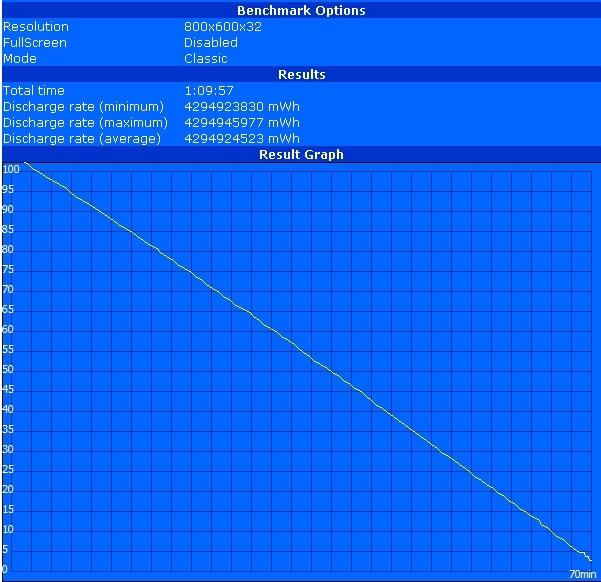 The tested model is the currently highest performance notebook in the M10 series. The component related sections of this review, such as battery life, can only be partially transferred to other models. 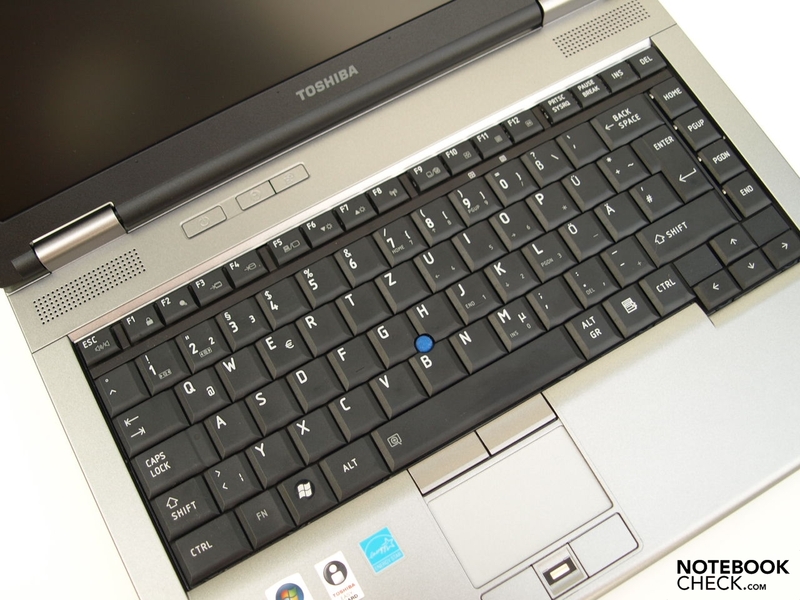 At first glance, the case of the Toshiba Tecra M10 does not appear substantially different from that of the Tecra M9, which we reviewed in January 2008. Remained has in any case, in contrast to the current trend of making notebooks ever thinner, a solid construction with almost four centimeters height, and for a 14.1 inch format notebook, considerable weight of over 2.5 Kilograms (inclusive battery), whereby the additional weight of the power adapter of about half a kilogram must be considered when travelling. 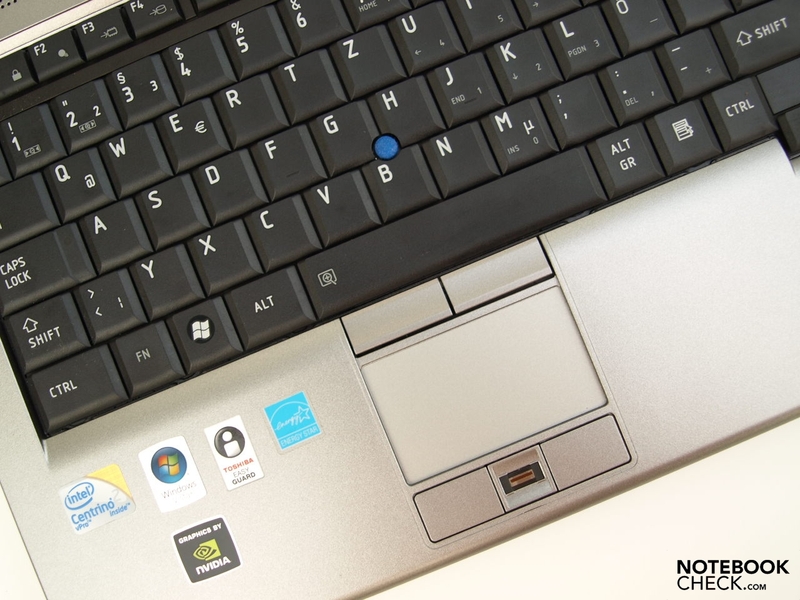 Equally the color scheme has not changed since the Tecra M9: Display lid in matte silver metallic with a high gloss Toshiba logo in the center, black keyboard with blue trackpoint, all around once again silver metallic with all other components in black. With the choice of materials Toshiba again mainly selected simple plastics. Hence it is no wonder that the stability of the case has not improved over that of the M9. 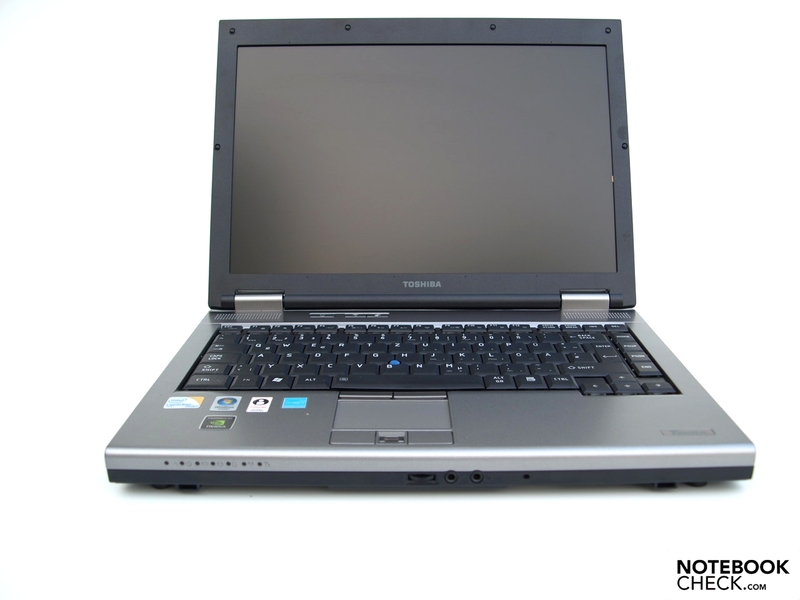 Weak spots are again the areas above and below the optical drive, the hand rest surfaces, and also the area above the keyboard which can be depressed with moderate pressure. The twisting stiffness of the base unit is however satisfying. The display and lid achieved somewhat better results in our stability test. When lifting one of the corners it is barely warped, and also withstood moderate external pressure well. The wide display frame could be a little more pressure resistant though - equally here though there are no picture changes when switched on. Nevertheless the functional design has changed somewhat, for example the location of the finger print reader and the arrangement of the interfaces - more about this later. Furthermore, with the M10 the transport fastener has been foregone. 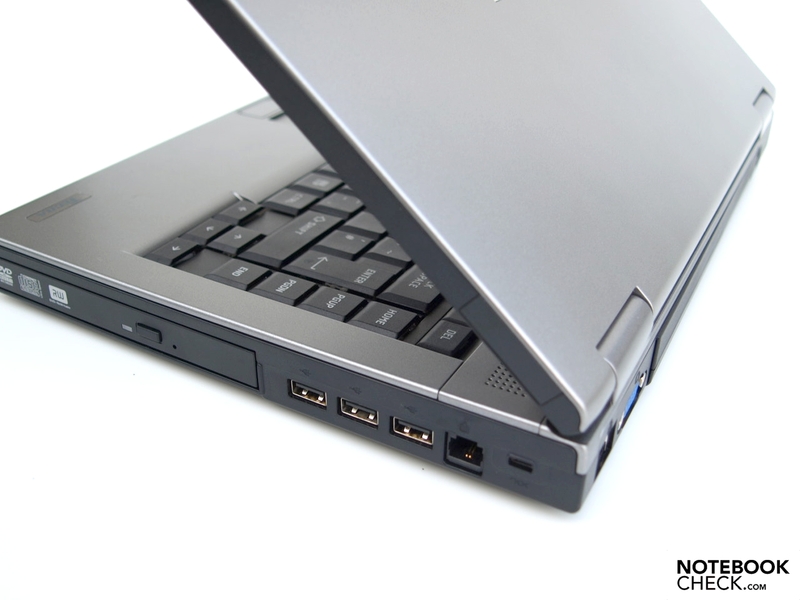 Since the clamping force of the hinges are not sufficient to avoid a slight opening of the notebook when held upside down, it is advisable to take precautionary measures, so that sharp objects cannot get into the gap between the keyboard and the display. 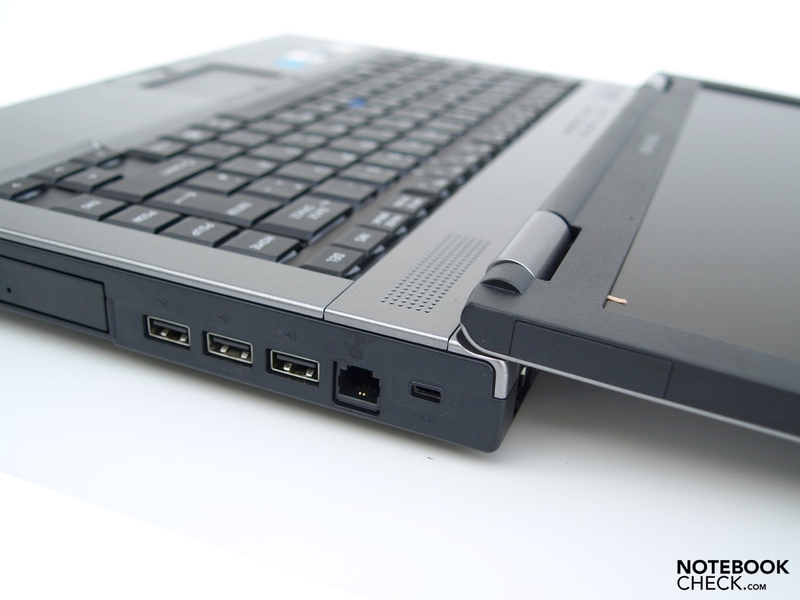 The interfaces include, as can be expected from such as expensive business notebook, an on the bottom located docking port - albeit only optional according to the manufacturers website. To this the compatible Express Port Replicator II, model no. 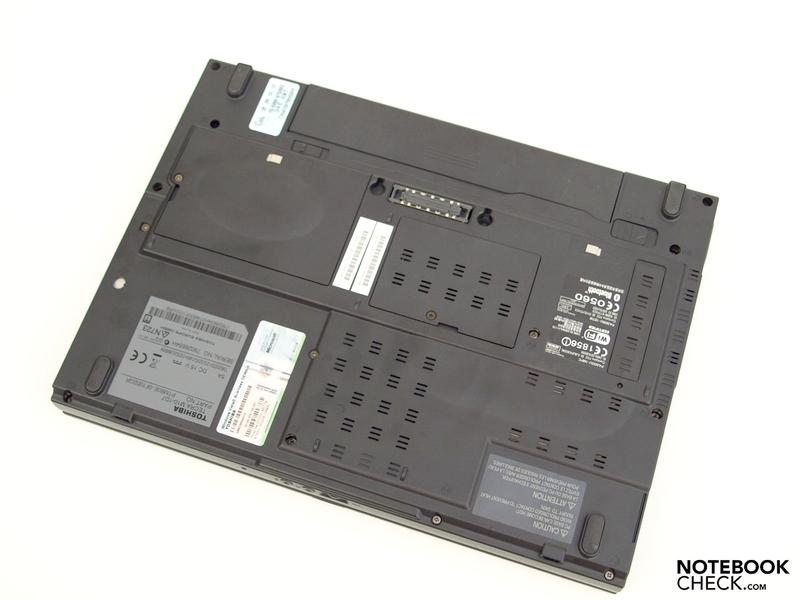 PA3680E-1PRP, can be connected; which can also be used with the following Toshiba notebook series: Portégé M750, Tecra A10, Tecra M9 Serie, Tecra R10, Tecra S10. An available Express Port Replicator II can thus still be used. In addition to a total of 6 USB-2.0 ports (4x backside, 2x side), serial and parallel ports, audio interfaces, Gigabit LAN, and VGA, the docking station also offers a DVI-D digital display interface. Directly on the base unit a serial interface can be found for connectivity to older machines and devices. Altogether 3 USB-2.0 ports (all on the right side) and a combined e-SATA/USB-port are provided. 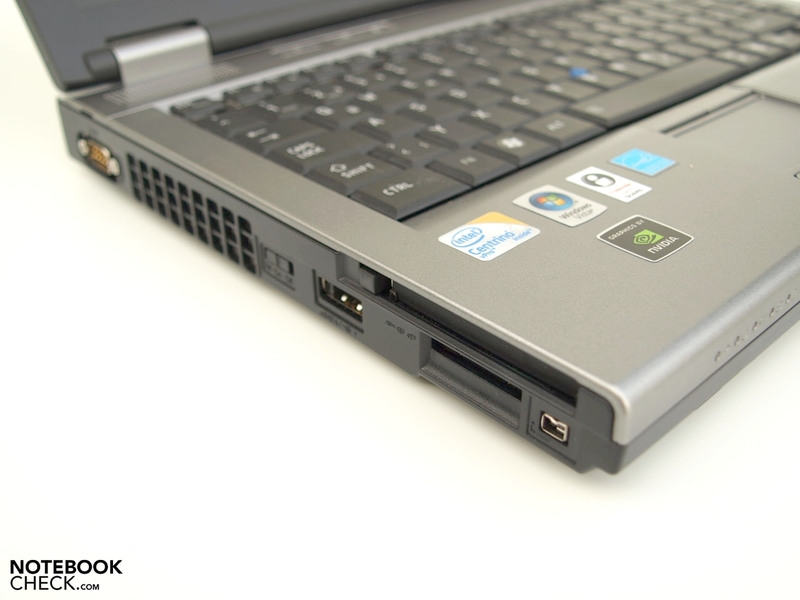 With the PC card slot for type II cards, the functions of the laptop can be extended. The integrated 5-in-1 card reader supports SD cards with up to 16 GB, memory sticks with up to 256 MB, memory stick pros with up to 4 GB, MultiMediaCards with up to 2 GB, and xD-Picture cards with up to 2 GB. The audio interfaces on the front are well positioned for the connection of head phones. For a permanent connection to the audio interfaces, it is however better to use the Express Port Replicator II. Depending on usage, the arrangement of interfaces is otherwise also satisfying. Probably permanently connected interfaces, such as LAN and VGA can be found on the back, or more specifically along the side at the back. Alone the e-SATA port (combined with USB) in the middle of the left side and the fan vent on the left side might not be optimal for left handed people. Via an cable Ethernet network connections are possible with the integrated Intel(R) 82567LM Gigabit Network Connection (10/100/1000MBit). The Intel Wireless WiFi Link 5100 (abgn) module provides for wireless WLAN communications. Bluetooth is also on board. UMTS can be obtained with an additional USB-modem (see limitations due to port arrangement) or better yet with a PC card. In addition the Tecra M10-1D7 also has an RJ-11 modem port, which should prepare for communications in areas with bad infrastructure. With the Firewire interface (IEEE 1394) called i.Link by Toshiba, it is not only possible to achieve fast connections between computers and multimedia- and peripheral devices, but also to use this as an alternative to Ethernet (IP over FireWire). Windows Vista Business 32-bit is pre-installed as the operating system. 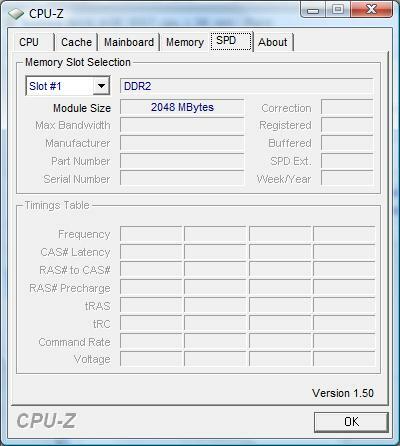 Due to technical limitations, only about three Gigabyte of the four Gigabyte physical RAM are available as memory for application data. A recovery DVD is unfortunately not contained in the accessories. 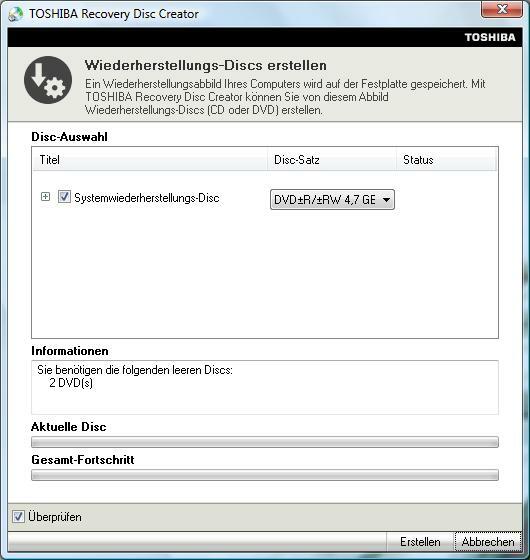 A user should therefore create one immediately following the first time the system is started with the help of the pre-installed Toshiba-Recovery-Disc-Creator, in order to enable recovery of the system in the case of a hard drive failure. Moreover by pressing F8 while booting, and selecting Windows Repair it is for instance possible to simply restore to the original delivered state from a hidden partition . 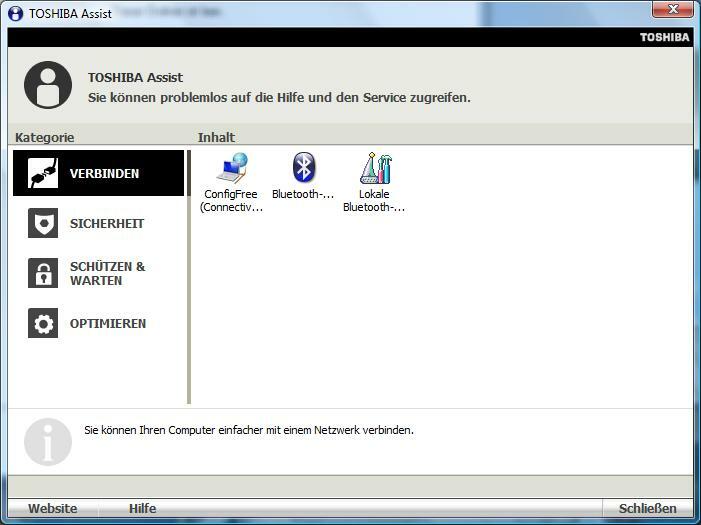 Toshiba offers 2 years international bring-in manufacturers guarantee inc. home pickup service in Germany and Austria, when registering the repair on the Toshiba notebook hotline for the Tecra M10. The security features are also familiar to us from the Tecra M9, where they already proved themselves. For a business notebook this can also be expected, since sensitive data should be protected even in the event of loss of theft. 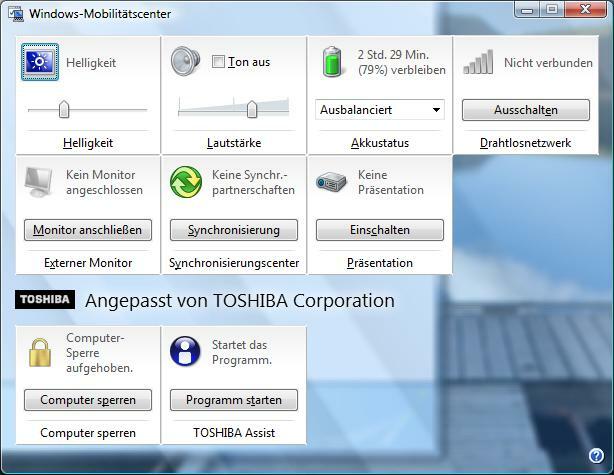 On the Tecra M10 once again the Toshiba Security-Assistant serves as the central control for security features. With this it is possible to activate diverse security levels within seconds. 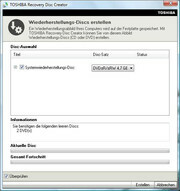 The Windows logon can for instance be secured by a finger print, the hard drive can be made unusable in other computers with a special password, and with the help of the integrated TPM security chip encrypted containers for particularly sensitive data can be created. Particularly to highlight is the excellent user guidance. Each option is annotated by an assistant with the advantages and disadvantages, and subsequently set up step by step. Risks are also elaborated upon, so that the user is not inadvertently locked out of the system. Thus also less experienced computer users can protect their notebook securely and quickly from access by strangers. Brilliant! 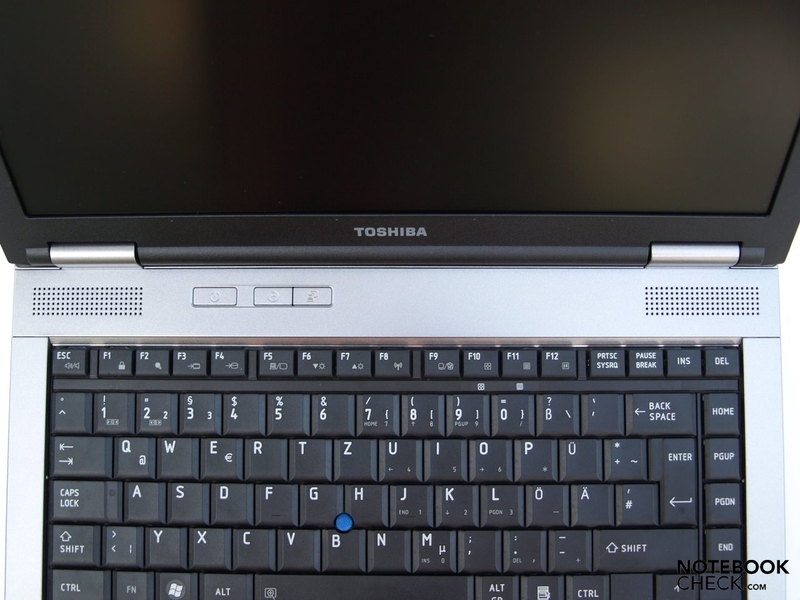 So that it doesn't take an eternity to overcome all the security settings at Windows logon, once all the security measures have been successfully configured, Toshiba additionally provides an interesting comfort feature by the name of Wireless Key Logon. The special thing about it: The key to the notebook is the users mobile phone. 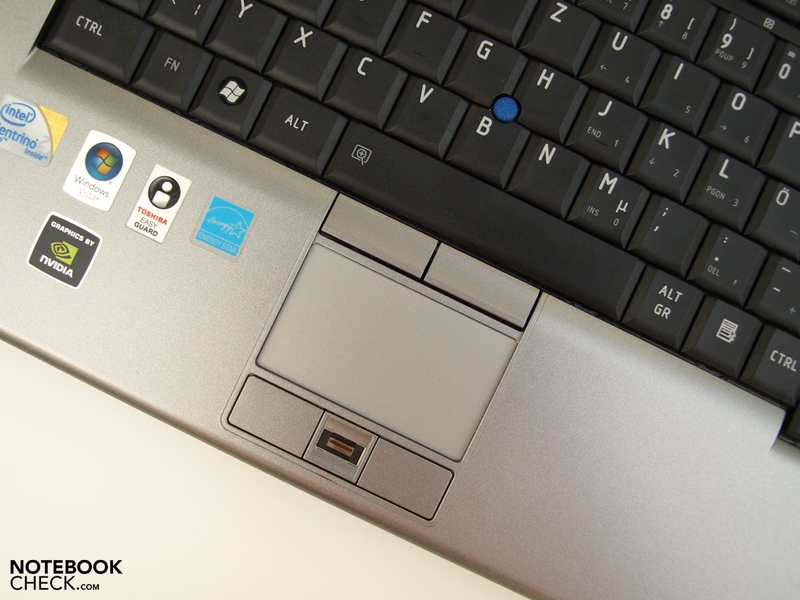 As soon as configured properly and with Bluetooth activated with a connection established, the BIOS password and other security measures are no longer requested. Instead the user can choose whether to proceed directly to Windows, or whether to provide a finger print or enter a password. 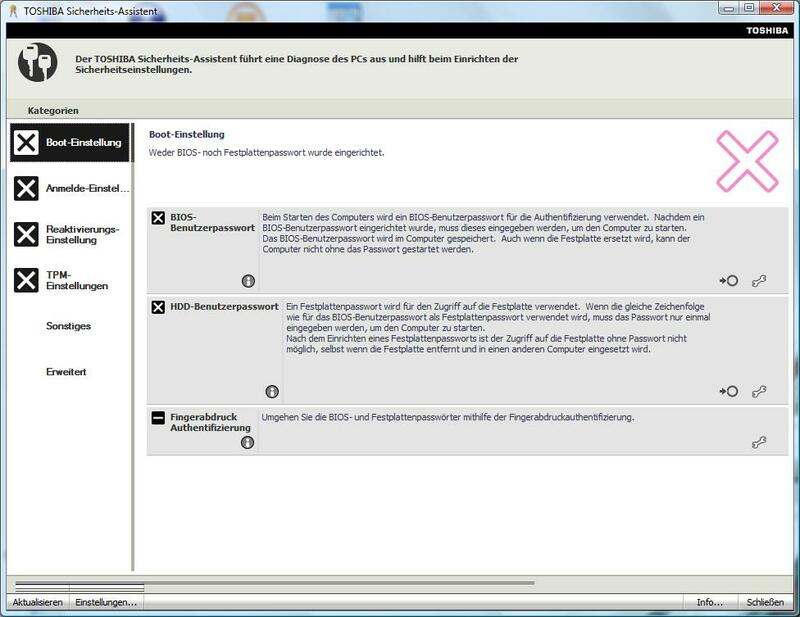 If the user moves out of range from the notebook with the mobile phone while working, then the notebook is automatically locked until the user returns. 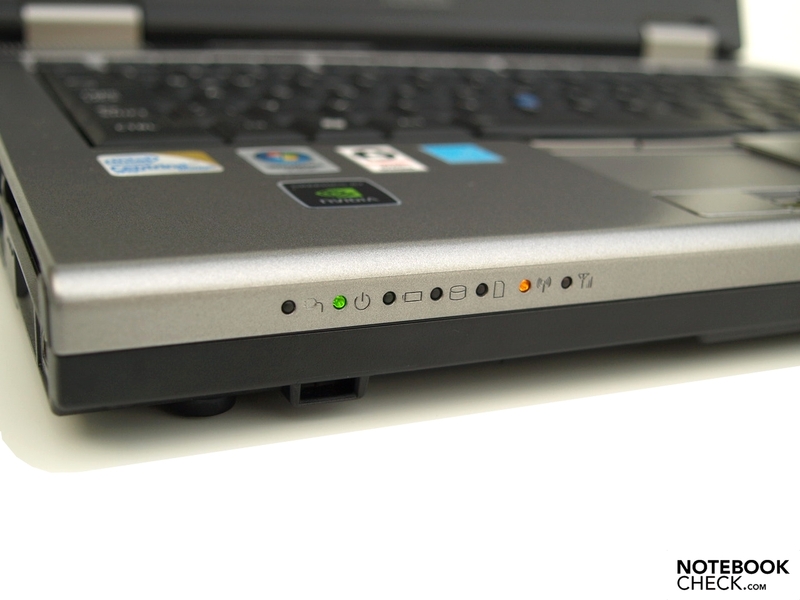 It is however required that the Bluetooth function on the mobile phone and notebook are permanently active. 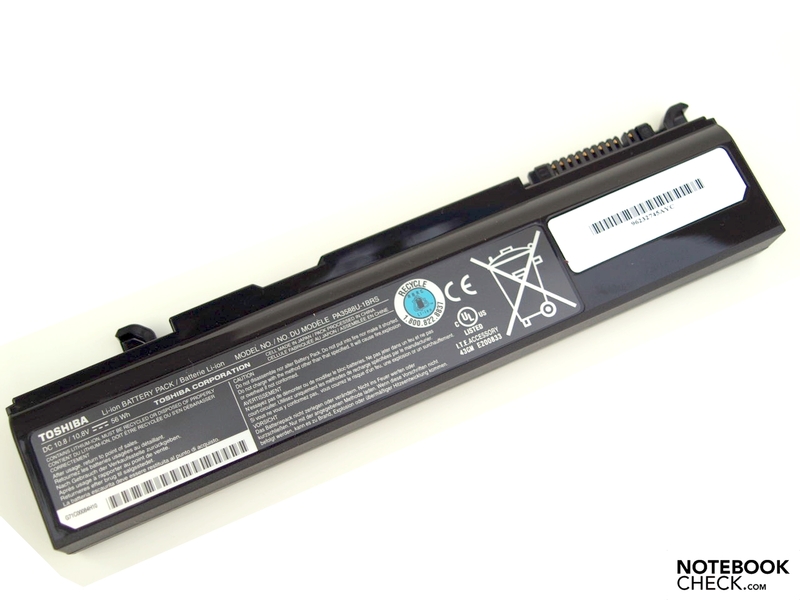 This can be particularly draining for the battery of the mobile phone, and can thus quickly lead to an empty battery, something that Toshiba points out several times during the configuration. If the mobile phone is switched off, or out of reach of the notebook, then the other security measures such as finger print scanner and BIOS password are automatically enabled and require the user to authenticate. The entry devices are also largely already familiar from the Tecra M9. The central entry device is once again the strong, matte black keyboard, which scores with a classical keyboard layout and 87 keys. The keys are clearly arranged into different functional groups, and are all found in familiar positions. To begin with the English labeling of some keys can take getting used to when working with other languages. Haptically the keyboard definitely makes a good impression. The individual keys sit firmly on the sub-construction, which does however bounce through a little when typing energetically. The stop is appealingly smooth, and the pressure point well defined. Altogether typing with ten fingers is possible without problems right from the start. 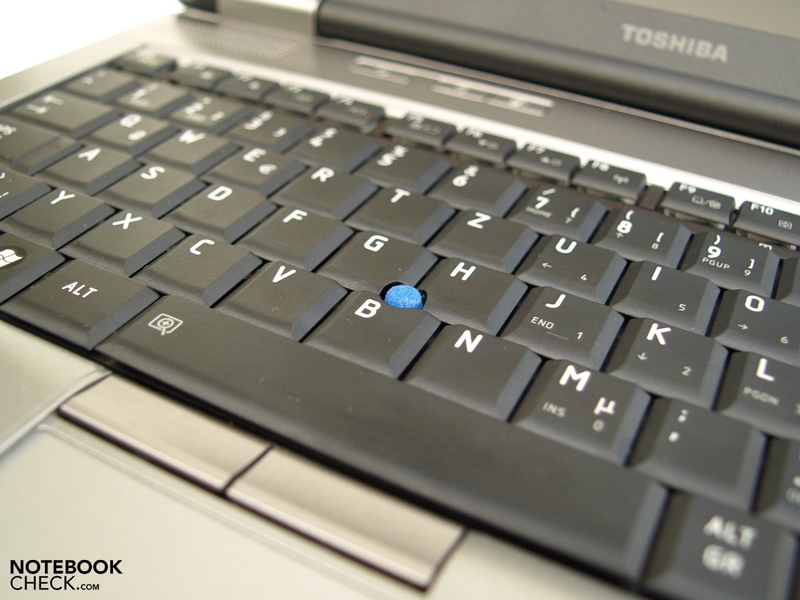 The blue trackpoint and touchpad are also already old acquaintances from the Tecra M9. The trackpoint provides an effortless and precise control of the mouse pointer. Additionally it is also ergonomically and sensibly located between the B, G and H keys. The two corresponding buttons below the trackpoint work reliably, and their lift and acoustic feedback are also decent. 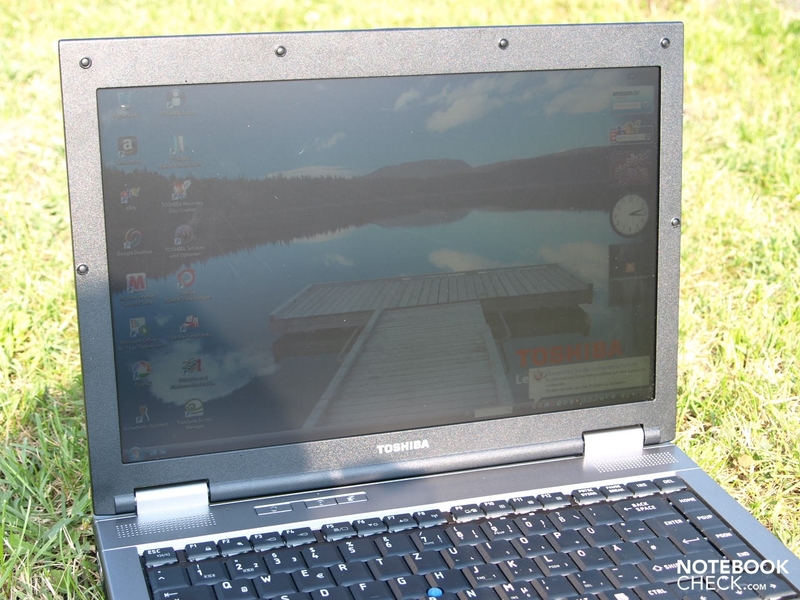 On the touchpad Toshiba has obviously made some refinements with respect to the Tecra M9, so that a clear improvement in operability has been achieved. It is now also possible to precisely control the mouse pointer with this mouse replacement. The corresponding buttons are quiet and easy to operate, nevertheless the pressure point could be a bit more pronounced. A 14.1 inch TFT display in a 16:10 format with WXGA+ resolution (1440x900 pixels) by Toshiba is intergrated into the Tecra M10. Specifically this is a Toshiba internal TOS508B panel. In keeping with a business notebook this was covered with a matte surface. With a maximum brightness of 174.1 cd/m², measured in the central segment, it performs better than the brightness of the M9, but is nevertheless not one of the brightest displays. For a TFT display the brightness level is however satisfactory. Although on average it only achieves 151.1 cd/m². The illumination is also satisfactory with 79%. For use outside more brightness would nonetheless be preferable. The maximum brightness in the central segment gives, in combination with the measured black level of 1.13 cd/m², a calculated contrast ratio of 154:1. 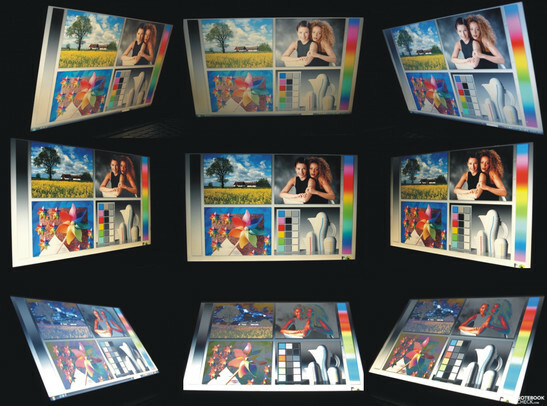 Subjectively the colors could also be better for multimedia applications, although for office applications it is sufficient. 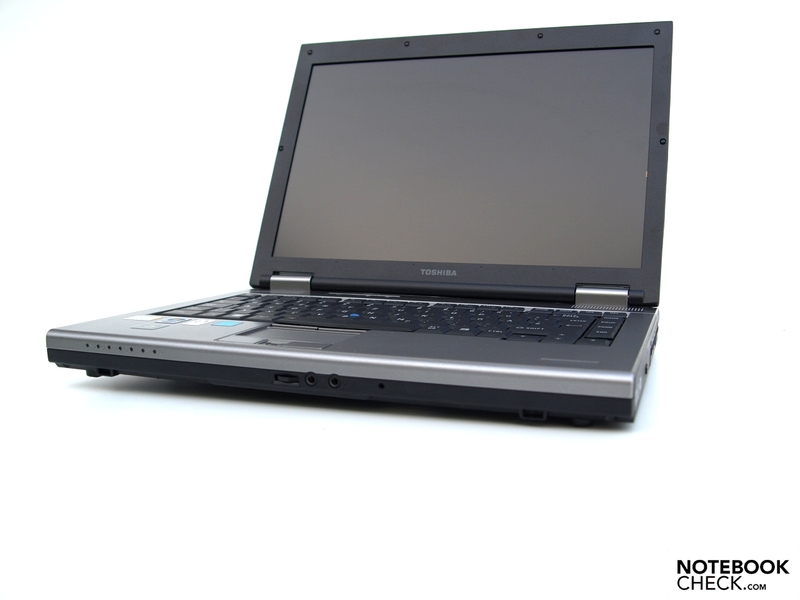 With respect to viewing angle stability the Toshiba Tecra M10 also provides an average performance compared to the competition. Horizontally the working area is sufficiently large. In comparison movements in the vertical plane lead to changes in the picture much more quickly, for instance with darkening and color changes when looking from above or below. 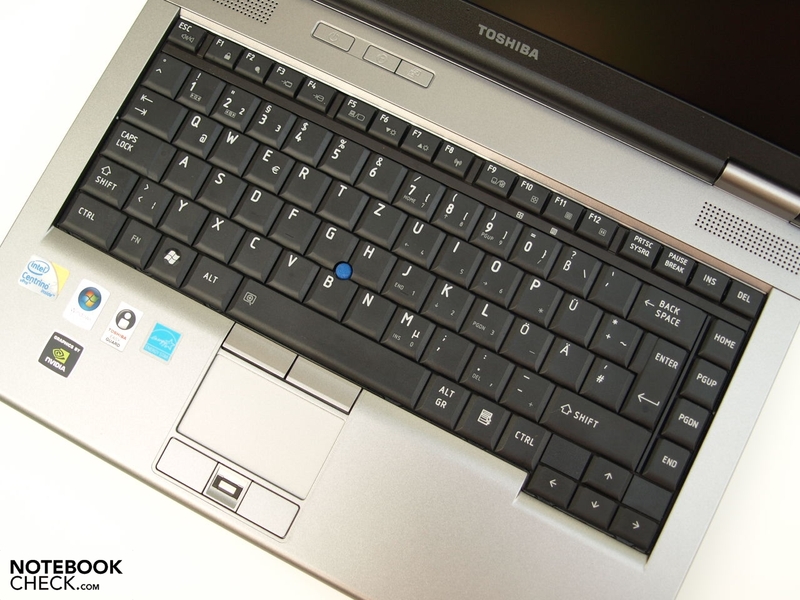 Independently from the definitive choice of model, Toshiba provides the Tecra M10 with modern Core 2 Duo processors by Intel. Although only more expensive models, such as the one tested, use the Centrino 2 with vPro Technology. The M10-1D7, which is currently the best equipped and therefore the most expensive model, uses the PM45 Express chipset, and offers decent processing power with a Core 2 Duo T9600 CPU. This is a two core processor with 6 MB L2 cache, 2.8 GHz clock speed, and 1066 MHz FSB, which is manufactured using the 45 nanometer lithography process under the code name 'Penryn'. With 35 Watt Thermal Design Power (TDP) the power consumption of the Core 2 Duo Txxx, is higher than that of Core 2 Duo Pxxx processors of identical clock speed, despite equal performance. Detailed information regarding the processor can be obtained from the manufacturers website. For a performance comparison please check our benchmark list. 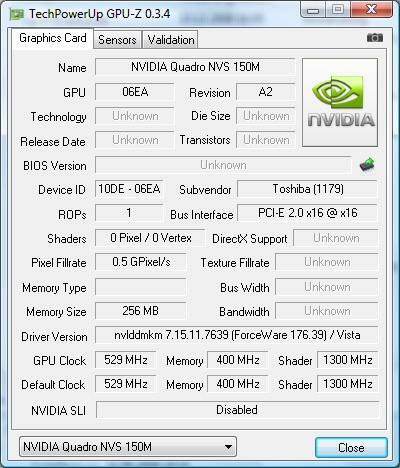 Responsible for pixel calculations is an nVidia Quadro NVS 150M. 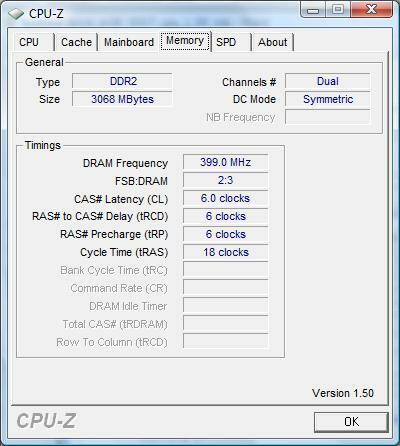 This is based on the chip of the Geforce 9200M GS, although BIOS and drivers were optimised for applications and stability. One advantage of this independant graphics solution is that it integrates PureVideo HD for decoding of (HD) videos, through which the CPU is relieved for this task. To the detriment of the graphics performance, the Quadro NVS 150M was only fitted with DDR2 graphics memory. 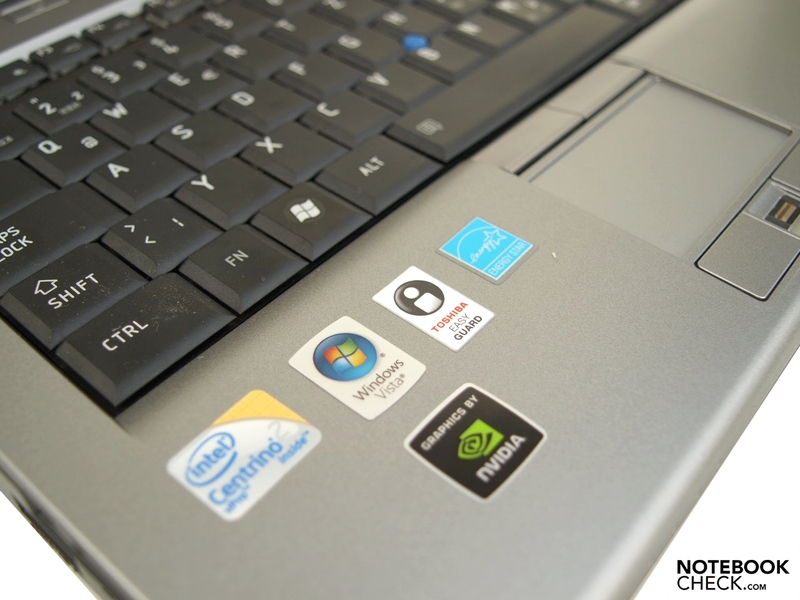 In comparison to Quadro NVS 150M cards with GDDR3 memory, the graphics performance is reduced by approximately 20%. Some lower budget Tecra M10 models, must suffice with an intergrated Intel GMA 4500M HD graphics chip. Since computer games are not included in the typical spectrum of applications for a business notebook, and because both graphics options were not developed for 3D intensive applications, we refer the reader to our article "Computer Games on Laptop Graphic Cards" in this context, which provides details of graphics performance for certain games, and also our benchmark list of mobile graphics cards. 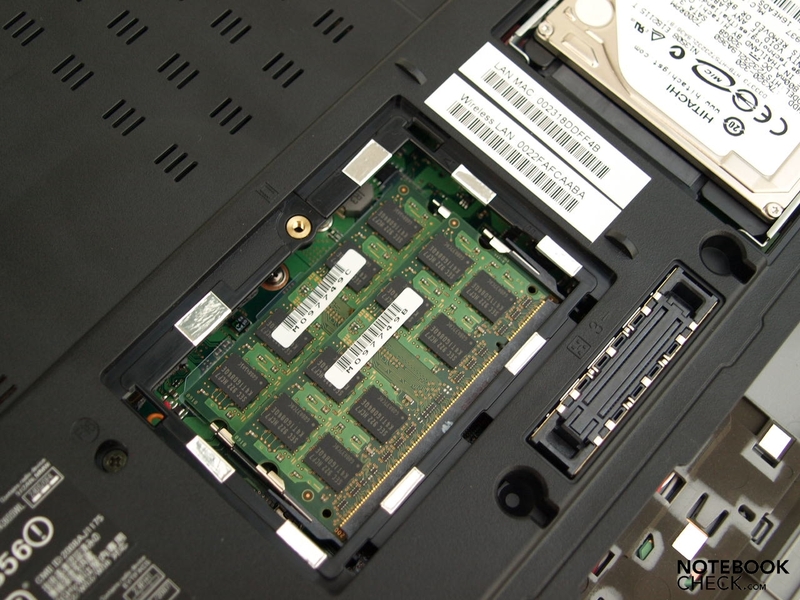 With regard to Random Access Memory (RAM), our test candidate as well as several other models are supplied with two 2 Gigabyte DDR2 RAM modules. Altogether this amounts to a gross RAM capacity of 4096 Megabytes. Other M10 models are only supplied with 2 Gigabytes, or 3 Gigabytes of RAM. Technically all Tecra M10 models could support up to 8 Gigabytes. Although it would be possible to increase the RAM for even a layman via an easily accessible maintenance lid, the pre-installed Windows Vista Business 32-bit operating system does not address more than 4 Gigabyte. 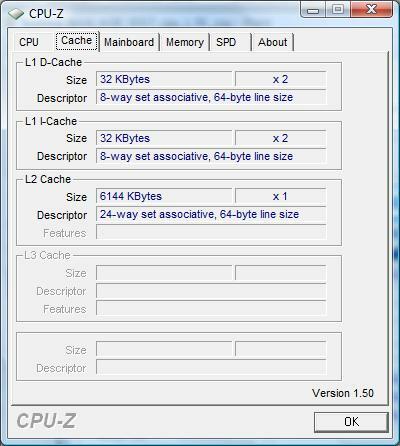 Even with 4 Gigabytes of RAM a 64-bit operating system would provide a more efficient memory utilization; whereas a 32-bit operating system can only provide just over 3 Gigabytes of the available RAM memory for applications due to characteristics of the processor architecture. 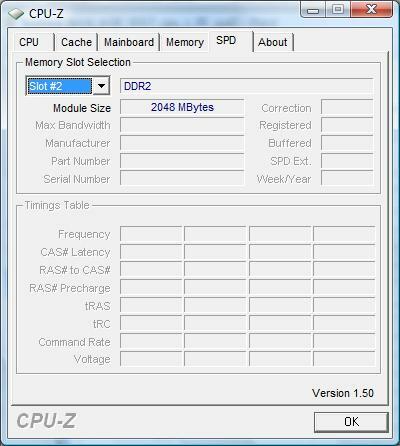 When upgrading to a 64-bit operating system, it is also important to take into account the compatibility of drivers for peripheral devices. The mass storage provided completes the performance relevant inner life of the Tecra M10. The potential buyer has a choice of models with between 160 Gigabyte and 320 Gigabyte hard drives. In the USA SSD drives with 128 Gigabyte are also provided as an option. Our test candidate again offers the premium configuration with a 320 Gigabyte hard drive by Hitachi, specifically the HTS723232L9A360. 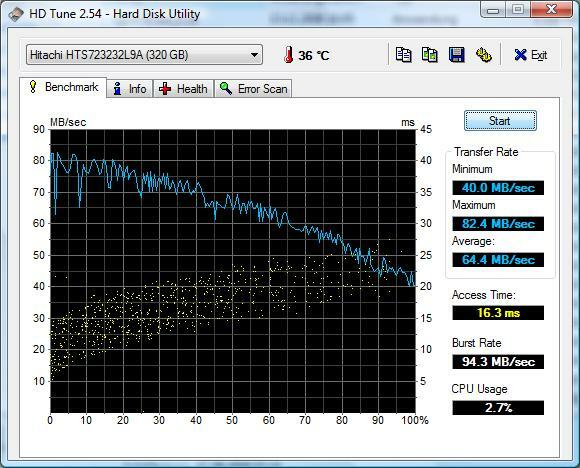 With 7200 RPM rotation speed, this is quite snappy and managed to convince in an HDTune test with good data transfer rates and low access time. 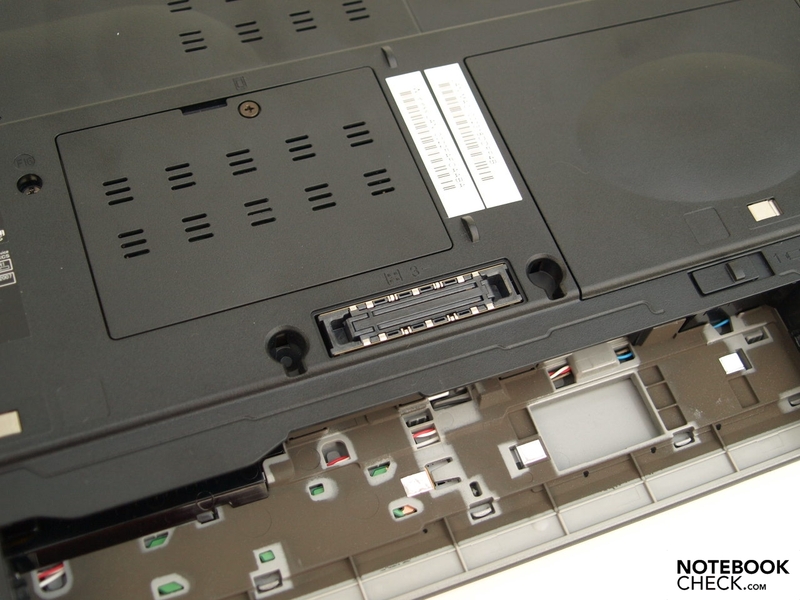 The Tecra M10 also contains an optical drive, specifically the DV-W28S-RT by Teac. 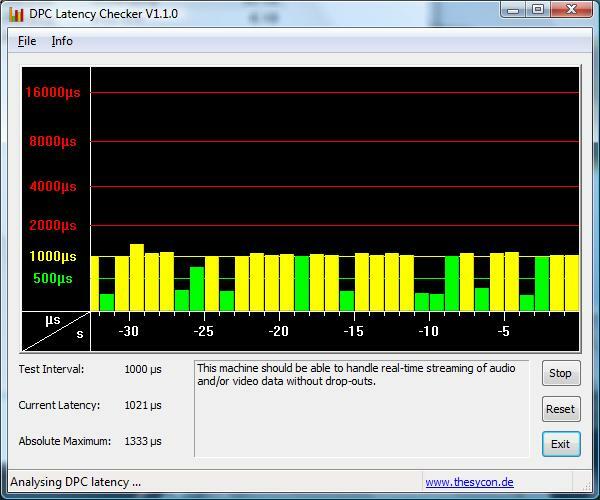 With the help of the DPC Latency Checker tool, we also examined the maximum latencies occuring in Windows. If latencies are too high, this can lead to problems with synchronisation when connecting external devices, e.g. pops and crackles with sound cards. In this respect the Tecra M10 is convincing. The latencies never reach into the red area. Even with a low load the fan is permanently in operation and causes a noise backdrop of 35.5 dB(A), which is however not furthermore negatively conspicuous due to the consistency. On the other hand, the permanent fan noise is enough to mask the access noises from the hard drive. Under a high load an average noise level of 38.2 dB(A) is reached, whereby the cooling system occasionally turns up to a maximum of 42.9 dB(A). 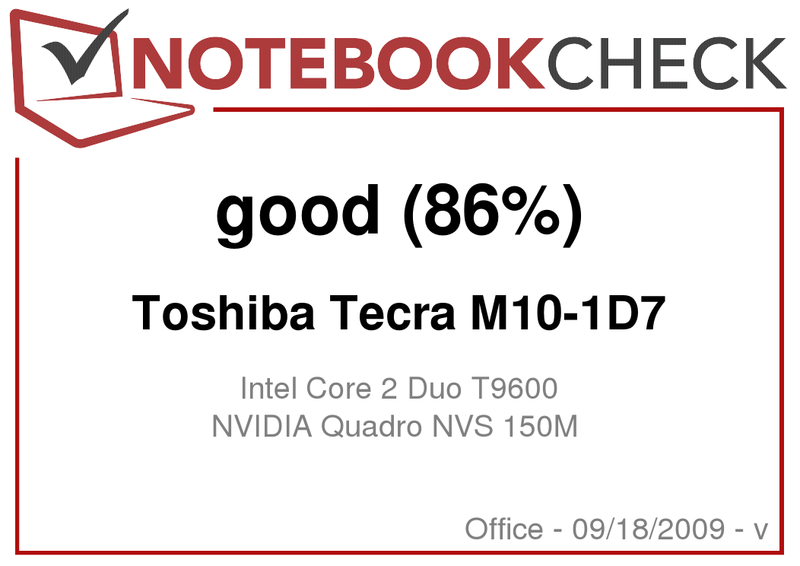 In exchange the Tecra M10 stays relatively cool despite comparatively high performance hardware. Under a high load the top reaches a maximum of 42.1 degrees in the left-middle segment. On the bottom 43.9 degrees are not exceeded in the left-back area. Alround it is noticeable that the highest temperatures were measured in the area where the fan is located. Since this device was not designed for permanent use under a high load, such as using the graphics card for intensive 3D applications, the temperature characteristics under a low load are more interesting. 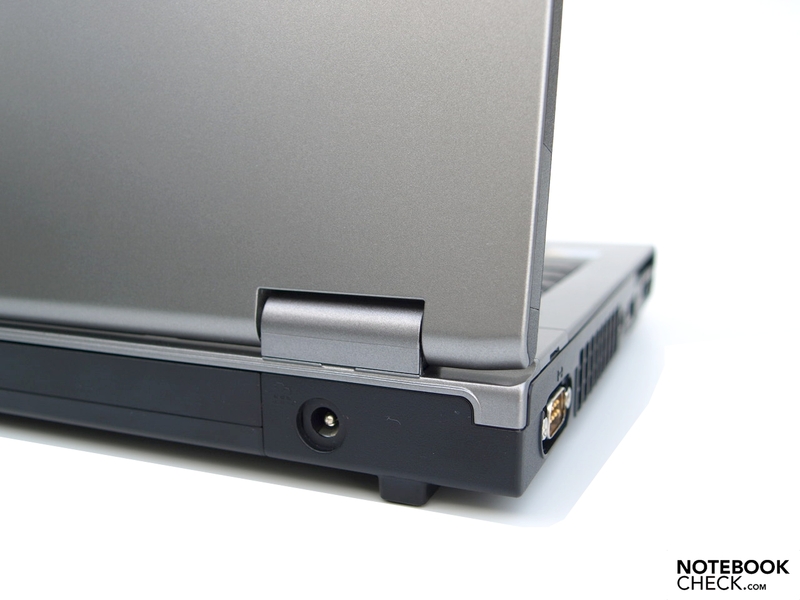 Under these conditions the device remains cool on the top and bottom sides, so that nothing is standing in the way of resting the notebook on the users legs during normal operation. (±) The maximum temperature on the upper side is 42.1 °C / 108 F, compared to the average of 33.9 °C / 93 F, ranging from 21.2 to 62.5 °C for the class Office. The two loudspeakers are located to the left and right above the keyboard, and thus have a relatively conspicuous location. The sound quality is definitely good enough for listening to background music or DVD movies. A particularly good sound quality cannot however be expected from a sound system without a subwoofer: the sound is somewhat tinny, with little bass and too much treble, the maximum volume is however sufficient. Although for a business device the sound quality does not play such a crucial role, as for example on a multimedia device. A sound quality improvement can be achieved by connecting a pair of high quality headphones to the 3.5 mm jack. This test did not provide any conspicuous results. The in-built battery provides a capacity of 56 Wh. Taking into account the high performance hardware components, this at least enables useful battery life times. Minimally, measured with the BatteryEater tool's Classic test, with a high performance profile, maximum brightness, and enabled wireless connectivity, an operating time of one hour and 10 minutes (70 minutes) was possible. 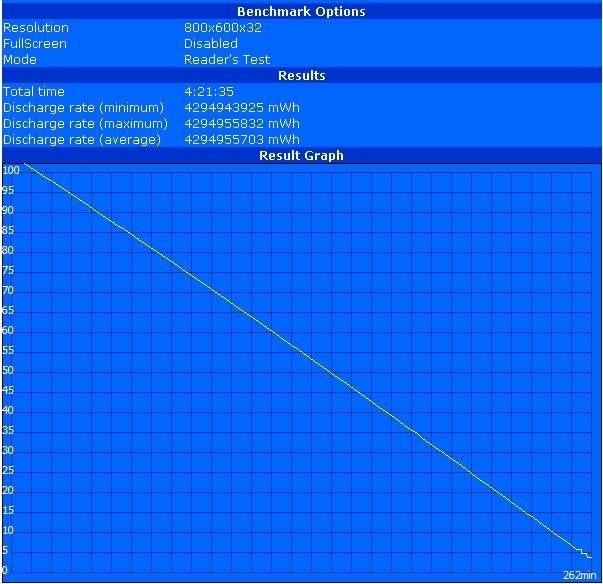 The actual times in practice will lie between this, and that measured with the Reader's Test (also BatteryEater tool), with energy saving profile, minimal brightness, and disabled WiFi modules, reaching a maximal power adapter independent time of four hours 22 minutes (262 minutes). In the practical WLAN test using the energy saving profile, and brightness level 6 of 8, we could achieve about two hours 46 minutes (153 minutes) without interruption from the battery. The picture looks worse during DVD playback, using the "Balanced" energy profile and maximum brightness. With just over two hours (123 minutes), this is however still easily enough for the average Hollywood movie with a duration of 90 minutes. To save power it would potentially be possible to select a model with a Core 2 Duo Pxxx CPU from the Penryn series. 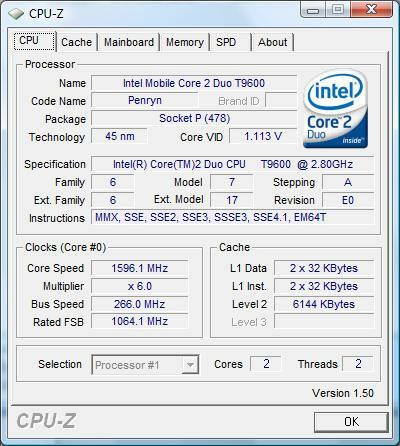 Intel Core 2 Duo Pxxx CPUs with the same clock speed provide the same performance, while only requiring 25 Watts, and thus less power. In this case a longer battery life would certainly be possible. 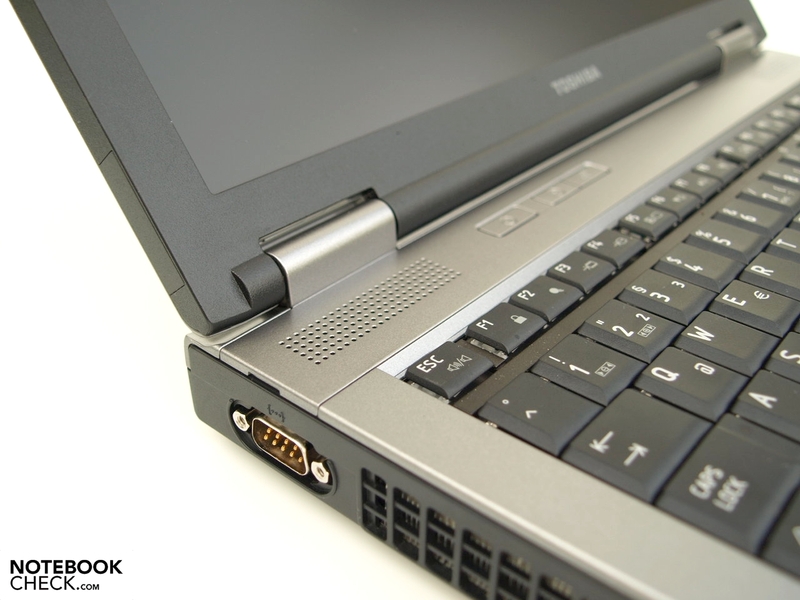 Toshiba is definitely not taking part in the competition for the slimmest notebook with the Tecra M10. Nevertheless this notebook knows how to please. Despite the fact that the pressure stability of the base unit does not entirely satisfy the solid impression suggested by the depth of the construction. The keyboard, touchpad and trackpoint, and the matte display surface invite the user to constant use throughout the working day, although the display is not completely convincing due to the brightness levels and contrast. When outdoors reflections do not pose a problem, although when under direct sunlight the wish for a brighter display does arise. 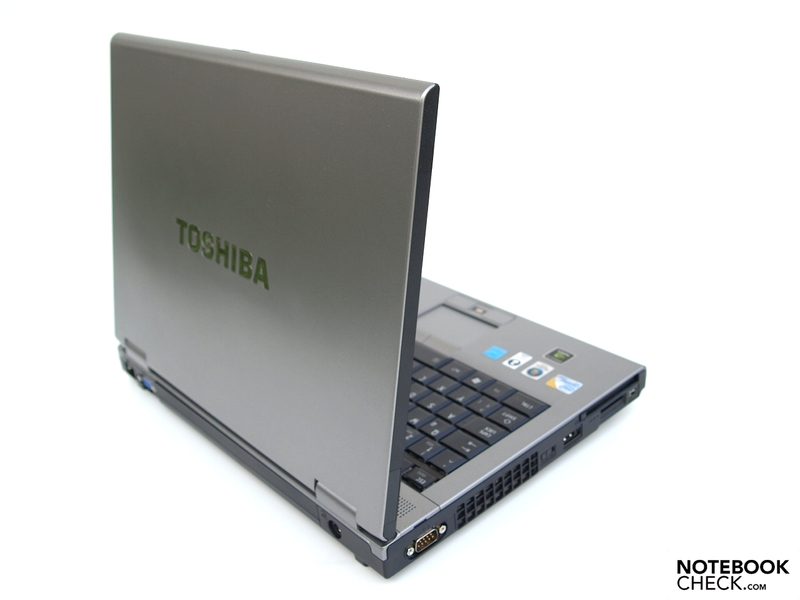 With respect to performance and energy consumption the Tecra M10-1D7 by Toshiba proves itself well balanced. 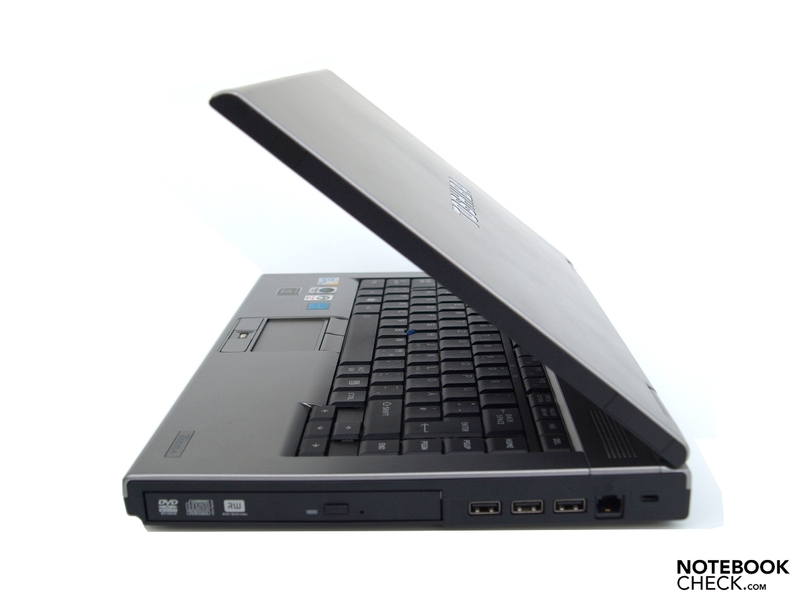 For office applications it offers more than enough processing power with the Core 2 Duo T9600. The graphics card, an nVidia Quadro NVS 150 M, is also optimised for professional use i.e. for stability. For demanding 3D applications or 3D computer games, for which the Tecra M10 was admittedly not designed, there are more powerful solutions. Due to the battery life, longer or shorter mobile usage is possible depending on configuration and usage. Altogether the Toshiba Tecra M10-1D7 is suitable for its designated application area, as a mobile work device for the professional user without too high demands on 3D performance, not least due to its comprehensive security features. 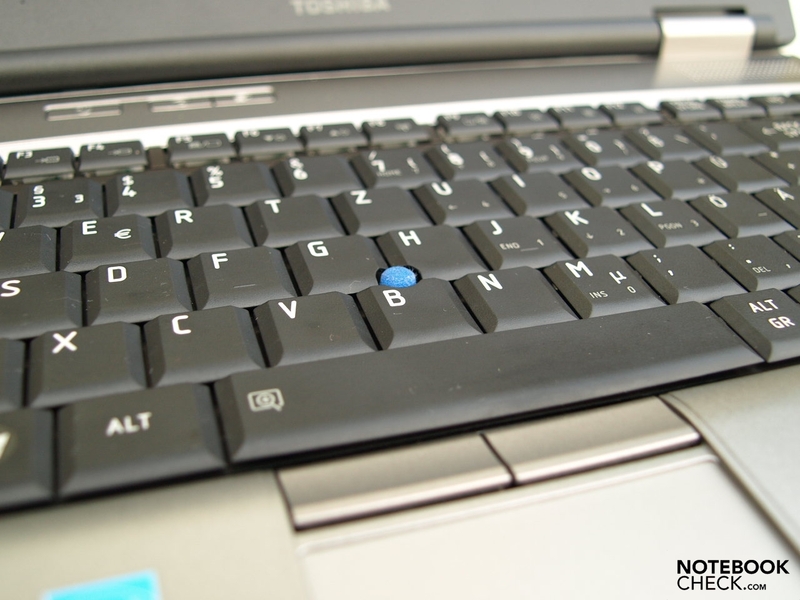 The status LEDs have low contrast labels and are covered by the left hand while typing. Good application performance but only relatively low 3D potential are provided by the Core 2 Duo T9600 CPU and the nVidia Quadro NVS 150M graphics card optimised for stability. ... or replace a hard drive. In use with little load the notebook stays pleasantly cool. The two loudspeakers are pretty good for a business device. For left handed people the warm air out of the vent or the combined eSATA/USB could cause constraints. 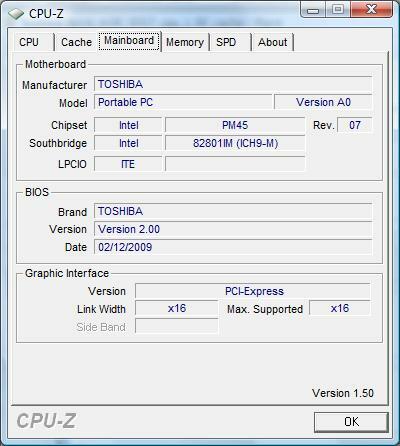 Toshiba has also not forgotten a serial port. Probably permanently connected interfaces (LAN, VGA) are located on the back. ...nevertheless weak spots can be discovered. 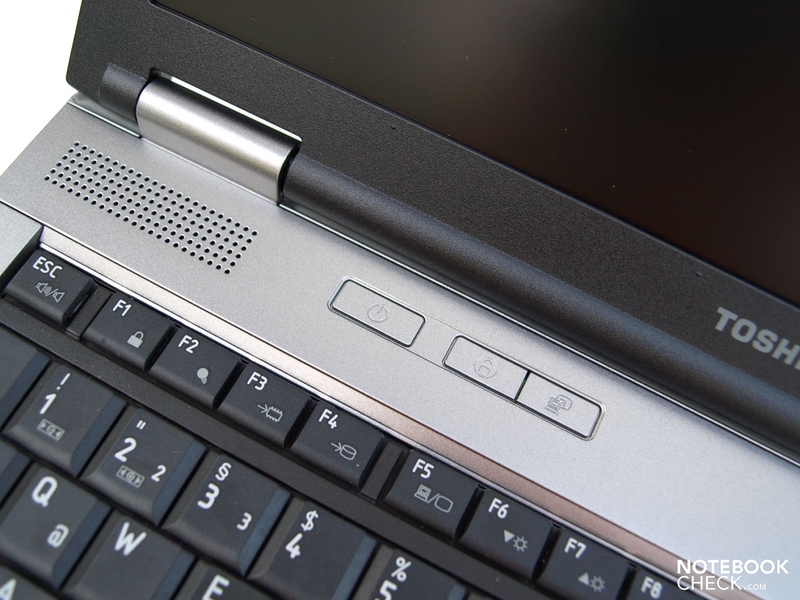 ... the Toshiba presentation button, which launches the Toshiba customised Windows Media Center. 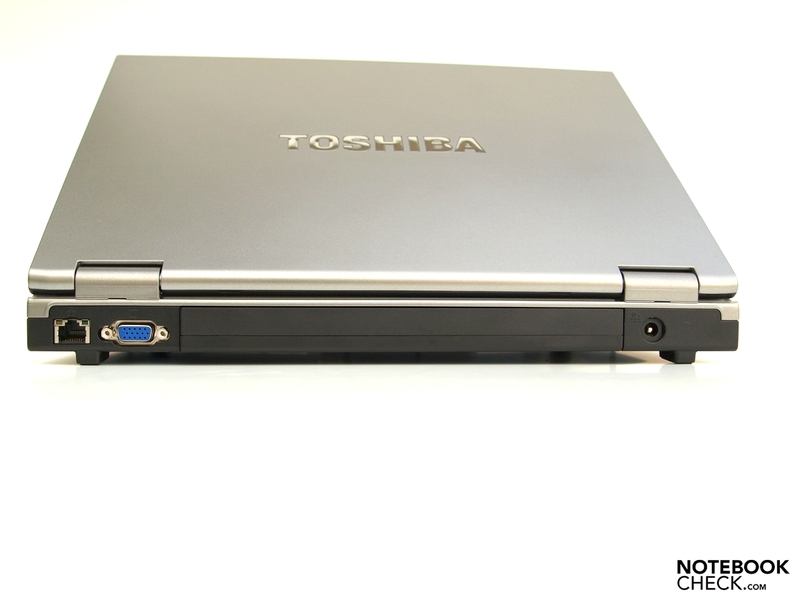 Toshiba has placed particular emphasis on easy to configure security features. ... and the finger print reader. Recovery DVDs for the pre-installed Windows Vista Business 32-bit are not included, these must be created personally. ... that allows a complete opening. With the included 56 Wh battery decent battery life is possible. The comprehensive and easy to configure security features. A brighter display, possibly with energy saving LED technology, with better contrast. That the case gives the impression that it is more solid than it is. Other 14.x inch devices with low-midrange graphics cards from the business class. 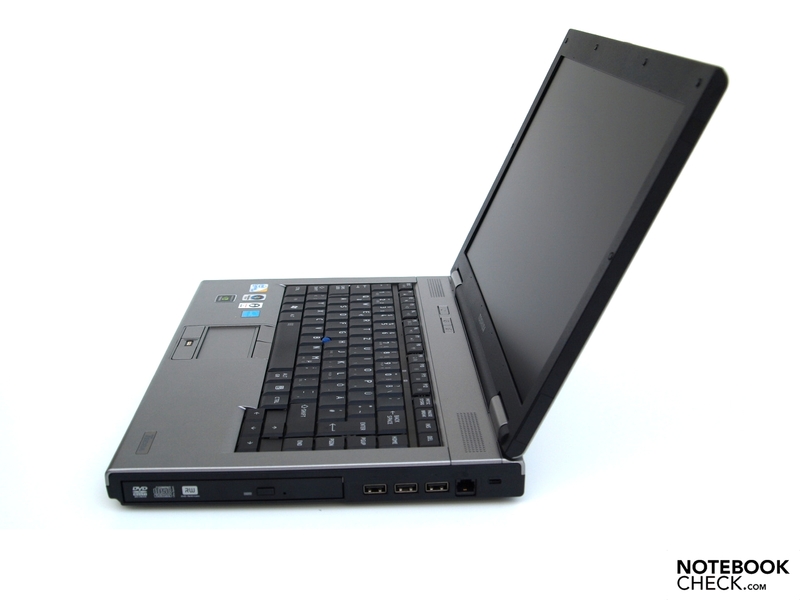 For example we have already reviewed the following notebooks: Lenovo Thinkpad T400 (GMA 4500M HD, Core 2 Duo P8600), the Lenovo Thinkpad SL 300 (Nvidia Geforce 9300M GS, Intel Core 2 Duo P8400), the Dell Latitude E6400 (GMA 4500MHD, Intel Core 2 Duo P8400) and the Samsung X22-Pro Boyar (ATI Mobility Radeon HD 2400, Intel Core 2 Duo T7500).